If you search your ancestors in Partinico, Sicilia, info about your Italian family are stored in the City Office archives or at the parishes. In towns and villages of Sicilia and in Palermo province registry offices were established around 1820: it means that you could find information in Partinico registrar as of that date. So, if your ancestors were in Partinico in the nineteenth or twentieth century, then you could try to contact the City Office of Partinico to know more. 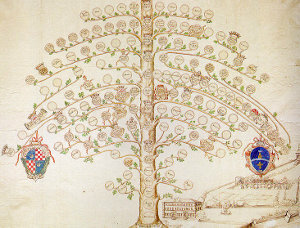 Before to start your genealogy research in Partinico, we suggest you to read our tips for your search . They are useful to search in sicilia and in Partinico too. 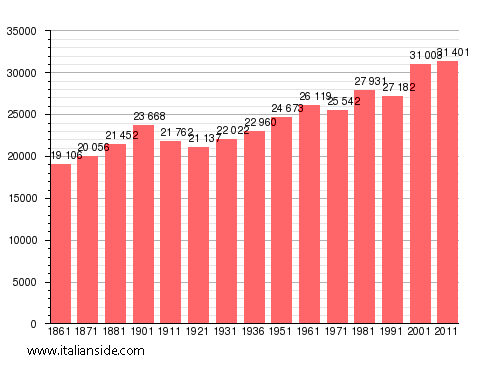 Next picture shows the demographic trends in Partinico from the Italian Unification (1861) an important info to understand how many people lived there in the past. It could be important to know if the last name you are investigating is a frequent surname in Partinico. As more your surname is common in Partinico, as more it could be difficult to find the right info about your ancestors in Partinico archives if you have not exact dates. Aiello, Amato, Barone, Battaglia, Bruno, Caruso, Catalano, Costa, Cusimano, D’Amico, D’Angelo, Di Maggio, Di Salvo, Ferrante, Ferrara, Gambino, Geraci, Giordano, Greco, La Barbera, La Rosa, Lo Cascio, Lombardo, Macaluso, Mancuso, Maniscalco, Mannino, Marchese, Marino, Martorana, Mazzola, Messina, Mineo, Orlando, Palazzolo, Parisi, Pecoraro, Piazza, Randazzo, Rizzo, Romano, Russo, Sciortino, Siragusa, Taormina, Tarantino, Vassallo, Vitale. Church archives in Palermo province may instead contain even older information, but they are far less accessible from abroad (and almost impossible by email). If you have the opportunity to visit Partinico and Palermo province, you could plan to investigate churches’ archives by yourself (or with us! ), but from abroad is very difficult to obtain any result unless you find a reliable local help. If you have the opportunity to visit Partinico and Palermo province, you could plan to investigate churches’ archives by yourself, but from abroad is very difficult to obtain any result unless you find a reliable local help. If your research is in a dead end and you need professional help from our local Italian genealogists write to partinico@italianside.com our expert in Partinico area will study your request and will reply to you with a research plan and a quote. I need a “Certificato di Battesimo” of my ancestor Antonio [di] Domenico, son of Alonso and Margarita, babtissed in the Church of Maria Santissima Anunziata of Partinico, on September the 9th of 1635. The secretary of the Parish has sent to me an email with a copy of the inscription but she say that it is “unreadable”. By email I send you this copy of the inscription sent by the Parish. Could you do anything to get the said certificate? Which will be the Price? We are planning to visit in the near future for an extended stay. I am looking for information for my grandfather, Melchiorre Miranda, born there 1881. Brother Pietro. Also about any of his family. We have traced our Sicilian heritage to Giuseppe Frisella, B: 1844 and Giovanna DiNapoli, B: 1839.. We have a photo of the couple. After Giuseppe died in Partinico, Giovanna came to the US. We have all four parents listed for this couple, but little as far as birthdates, etc. Giuseppe ad Giovanna were originally from Montelepre, but moved to Partinico. There is a road called Via Frisella in Partinico, and I’m wondering if that is named after Giuseppe’s family. They had 8 surviving children, and two that died at a very young age. Guiseppe manufactured charcoal. He also farmed, and owned cows, and delivered fresh milk to neighbors. I am trying to locate any information regarding my Great Grandparents Nunzia and Salvatore Noto. They are the parents of my grandmother, Maria Noto who was born in Partinico, Sicily in 1910, They came to America in 1913. I am planning a trip to Italy and would love to see if I have any relatives still living in Partinco or the surrounding villages. My Grandfather, Baldassare LaGrassa was the son of Carlo and Concetta LaGrassa of Messina, Sicily. would also love to see if I have relatives there as well. Any information on either or both would be very much appreciated. I am researching my grandfather Calogero Costantino, born 1859 in either Partinico or Corleone. Possible mother Carmela Salem and father Christopher. Married Rosa Maria Guida. Died in Manhattan on 8/27/1939 at the age of 80. Hello, I was researching my great grandfather. I know he came from Italy adn I am pretty sure Sicily. In his personal items he had several post cards with pictures of Partinico on them. I am assuming this was where he was from. US name was John Valente. that is all i know. My Great-grandfather was Francesco Tivoli. His death certificate says he was born 02 November 1875 in Partinico, parents: Pietro Tivoli and Giuseppa Currao. He always said that he was adopted. His marriage records say that he is the son of unknown parents but under the care of Filippo and Giuseppa Cilluffo. There is a birth record for Francesco Tivoli, son of unknown parents, born in Palermo on 4 October 1872. I don’t know how I can ever find out anything about my Tivoli family. I can’t seem to find anything on Pietro Tivoli and Giuseppa Currao. Hello Italianside, I know that majority of my father’s side resided in Partinico. The name changed at some point in the USA to Scaparro from Scaparra I believe because in script an A from O is pretty similar and most of my ancestors could not read or write according to the Census record in Manhattan, NYC. My 2x Great Grandfather was born in Partinico and his name is Diego Scaparra born Nov 11, 1888. His parents are Giuseppe Scaparra born Nov 22, 1857 also Partinico he married Margherita Coppola. Giuseppe’s parents are Bernardo Scaparra born 1831 in Partinico as well and his wife is Concetta Lo Iacono. Then as far back as Bernardo’s father Giuseppe Scaparra born 1802 Palermo his wife as Grazia Labruzzo and finally had gotten back to Giuseppe’s father Benedetto Scaparra born 1769 Partinico and his wife was Rosalia Addetta. I’m not sure how to confirm all of this info and was hoping you can help me on my search in Partinico. I have recently traced my ancestry back to Salvatore DiMaggio and Francesco Briguglio in Partinico. Beyond them I have not been able to go. Any information about where to go next would be appreciated. I have a Francesca Dimaggio in my family record. She was married to Giuseppe Candela. I have no birthdates, but probably around 1860-1870. The family record shows her father as Vincenzo Dimaggio (no birthdate), and her mother as Nina (no last name, no birthdate). Let me know if this helps, are you have any connecting information. My son and I are visiting Sicily this summer. We plan to spend a couple of days in Partinico so we can do geneaological research on my grandparents who were from Partinico and immigrated to the US in the 1920’s. My sons has tried e-mailing and calling one of the government offices but they never respond. Can you please recommend the best place to go in person to get copies of their birth certificates? We actually have a copy of their marriage certificate. Thanks. My great-grandfather was Vincenzo Ferrara from Partinico. He immigrated to Detroit, Michigan in 1912, Were his mother Girolama Biondo was. After 6 months of research I am coming to a deadend trying to find his father. If there is any assistance or advise you can give me, I would appreciate it. Hello – i have been trying to get some informations about ancestors from Partinico. I sent a letter 8 months ago to the city offices but have never heard anything. I also emailed the Archives in Palermo and they said to contact the Archives in Partinico. Can you advise the best way to get this information? Is there an email address for the Partinico offices that I could start with? Thanks – anything would be appreciated! If you would like to start a research in Partinico please send your request to partinico@italianside.com.